In case of no show or cancelling without a 5 days notice, the first night of stay will be charged to the credit card. We are a group of 3 friends from 3 different parts of the world who arrived to Romania and fell in love with the country. We decided to open a place for true travel lovers - open minded people who enjoy sharing their experiences, making friends, and having fun together. We hope the hostel we have created is not just a cheap bed but also a great place to be! That's why we have selected a mix of different places worth visiting - not only museums or tours but also cool bars and clubs, restaurants with good value, and secret sights only known to locals. We will make sure your time in Bucharest is filled with plenty of exciting options perfect for your individual taste. To be fair, The Midland is not exactly a design/boutique hostel. While we do have some interesting creations (a gigantic blackboard with info & events), we don't claim to provide 5* luxury at 1* prices. Instead, we're more interested in building a true backpacking experience that will make your stay memorable. And it looks like we're doing pretty well - check out our atmosphere/staff ratings to see how we stack up. Our capacity is only 28 beds, which means that you'll be treated like an individual, not just a drop in the ocean. Upon arrival, you'll get a free map explaining what, where, and how, as well as all the important info about the city. 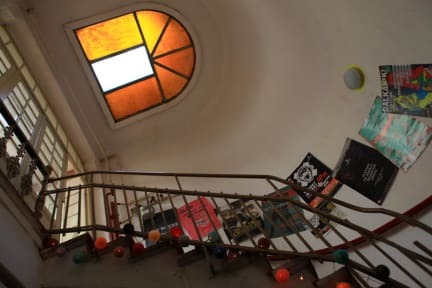 The hostel itself is set up to deliver everything a traveler needs - a big common area for hanging out and making friends, a big kitchen to prepare your favorite meals or cocktails, and big beds (90cm wide!) to have a comfortable sleep. We provide free wi-fi, guest computer, board games, free towels, free linens, free tea and coffee. And you'll never need to worry about security – not only do we have 24h reception, electronic lock on the door, and personal lockers, but we're also located directly across the street from the French embassy, meaning that there are plenty of guards keeping an eye on our entrance. We are located in the heart of Bucharest with walking distance to all main sights and easy access to public transportation. Our neighborhood is close to some of the coolest places in town and even has a 24h supermarket for those late-night munchies. The closest metro and bus stops are at PIATA ROMANA (a major transport hub about 2 minutes away, more info on our DIRECTIONS page). We are non-smoking inside, but outdoor smoking areas are provided. All 3 dorm rooms connected between with a lounge room share a bathroom with 2 showers, 2 toilets, 2 sinks and in order to acces it, you have to go accross the lounge room to get into it. Our private room is located 1 floor downstairs from the hostel and is not ensuite, has electric heaters during winter, no Air Con in the room, but we provide fans on request. The apartment is located in the backyard of the building with a separated entrance, has its own bathroom and own kitchen, king size bed, TV with Netflix, fast Wi-Fi and phone access, own heating system, no Air Con in the room, but we provide fans on request. Pets and families are not allowed. The hostel and it's guests interact, drink, & eat together, so if you expect a very quiet place, please contact us so we can redirect you to another place. Please be aware that guests under the age of 18 are not permitted except in group cases where the entire hostel is rented. For groups of more than 8 guests, please contact us for approval prior to booking. You are in good hands with our outstanding Romanian and international multilingual staff - Marius, Tina, Anca, Serban, Robert and Adrian will make sure your time in Bucharest is well spent and that moving on to the next place by plane, train, or bus is as easy as possible. 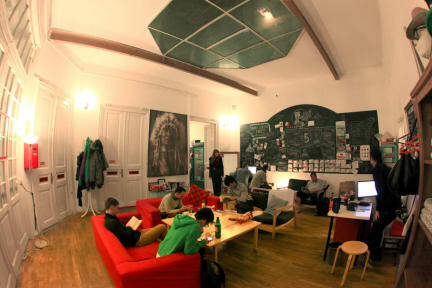 Cool hostel, with a very helpfull staff. The hostel has a nice commom area, but can be a little disturbing because is too close to the rooms, so hope to not face rude guests... I went to the hostel walking from the train station, it took me less then 40 minutes... And the hostel is close to one market and all the touristics atraction, you can visit them by foot, also very close the the bus station which takes you to the airport. Very good staff and atmosphere. Since the beginning they spent a lot of time to explain how the hostel works and also what to see in the city. The place is very nice, with an open central room where it is very easy to meet the others. Kitchen is also nice. If you are looking for something not only to sleep, but rather to get in touch with travelers, this is a good place. I was shocked when I arrived in this hostel, because it's in a old and dirty building. But ok, inside was everything clean, but still old things. For the price we paid was really good. The girls who work there are amazing, helped us with lots of tips about the city and tried to get a room for us earlier, because we arrived really early. It's in a good and central area. We booked the private room and it was clean and super spacious! So, I would recommend the hostel because the girls and our room.